A direct link to buy the map specific to each walk described under My Walks is given on the appropriate walk page. For walking, the 1:25000 series are stronly recommended as they show far more detail to help you navigate, not least field boundaries which are very useful for moitoring your progress across the countryside or working out exactly where you are. See the full range of 1:25000 Ordnance Survey maps . The best way to look after maps when walking is to use a proper map case. This needs to be waterproof and after trying various kinds over the years, my personal favourite is the Ortlieb Waterproof Map Case. This is not the cheapest type but I have found Ortleib to genuinely waterproof and I think my OS maps are worth looking after. Sometimes the Ortleib cases can be hard to source in shops but are worth seeking out. Alternatively, you could scan/print out a map on waterproof paper. The history of the Ordnance Survey began in 1791 when the Government directed its Board of Ordnance, the early equivalent of the Ministry of Defence, to survey the south coast of England so that it could be adequately defended from invasion. So "Ordnance Survey" (OS) was born and went on to comprehensively map the entire country. Thousands of triangulation stations were set up at high points around the country from which measurements were taken. These are the familiar Triangulation Pillars or "trig points" which walkers see on their travels. An example is shown below. Use of these has been superceded by the use of satellite and laser technology but the trig points themselves are a very useful navigational aid for walkers as they confirm your position on the ground. If you want to know more about the history of the Ordnance Survey and indeed about the history of maps in general, I enthusiastically recommend the book On The Map by Simon Garfield. This covers the history of maps from early sketches several hundred years BC to Google Earth. I genuinely could not put it down. It is fairly safe to say that "OS" maps are the best in the world giving a wealth of information in a variety of scales. The most familiar are the 1:50,000 Landranger and 1:25,000 Explorer ranges. They are available from most walking shops, many tourist shops and direct from Ordnance Survey. Amazon also sell them often at reduced cost and have a very efficient delivery. Some straightforward walks can be done using the 1:50,000 maps but the larger scale 1:25,000 are much more detailed with a greater number of paths and geographical features. This is the scale you should use and the one on which we will concentrate. On the 1:25,000 maps, 4 centimetres = 1 kilometre. (2.5 inches = 1 mile). For a quick visual reference, the smaller 1 kilometre grid squares are a mile corner to corner. To explain the logic of the maps (and please bear with this), Great Britain is covered by 4 large 500 kilometer x 500 kilometer squares each assigned a letter H, N, S and T.
These are each then sub-divided into twenty five, 100 kilometer squares each of which has another letter from A to Z (excluding I). So, if you take the Explorer Map for The North Eastern English Lake District, its top left hand corner contains the letters NY, the N representing the relevant 500 km square and the Y the relevant 100 KM square. These are further broken down into 10 km x 10 km squares which are allocated a number 0 to 9 working from the South West corner of each 10km square, north and east. 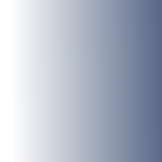 A further sub-division breaks each 10 km square into 1 km squares and these form the blue grid you see on an OS map and identified by the blue numbers across the top/bottom and left/right hand sides. The numbers are also shown at intervals across the maps for ease of reference in use. The 15160 works on exactly the same basis but working northwards. A simpler way of thinking about it is that in effect the 100 km square is broken into 100ths and the numbers from 00 to 99 are the numbers you see in blue marking the blue grid lines on the 1:25,000 maps. Each square is 1 km x 1 km. The "34170" is called the "easting" and the "15160" the "northing". OS references always give the two letters, the "easting" first, then the "northing"
In practical terms, because it is quite difficult to accurately assess manually on a map to six figures in each direction, OS references usually stop after 3 figures on each bearing thus the reference above would be NY 342 152 or NY342152 (rounded up). To demonstrate this graphically, see the image on the right. The trig point is always displayed as a triangle on OS maps so if we imagine the image to be the NY section of the country, the trig point is at position NY 34170 15160. The dotted lines represent the imaginary 1/10 divisions of the 1 km square. The bracketed entries are the high precision elements we would not usually quote. OS maps give the two letter coding at the corners and again if it changes part way across a map, if the map overlaps two grid letter areas. The OS Grid References are actually of little practical value in actually finding your way (except in relation to using GPS machines). They can be invaluable in an emergency however in directing rescuers to a specific point, assuming you know exactly where you are. All OS maps have a detailed key which explains all the symbols. The ones of most significance to walkers are of course the footpaths shown below.. There are a number of other paths/tracks marked on maps which may or may not be accessible to the public. Those on open country usually are but some could be private drives. This is one area where taking walks from books means someone has done the groundwork for you. 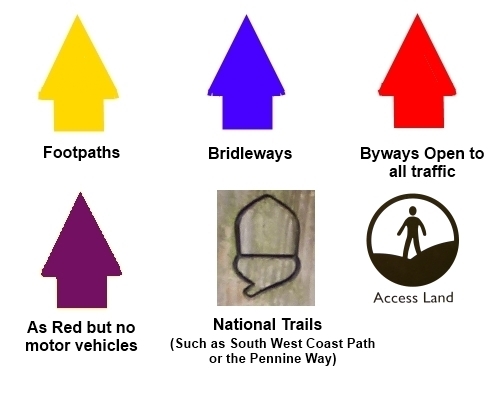 A full list of OS map symbols can be viewed on the Ordnance Survey website. Other important indicators on the map are the brown contour lines which follow the elevation and are at 10 metre vertical intervals and the patchwork of thin black lines which indicate field boundary walls. Walls and rivers/streams can all help you to relate the map to the terrain around you. The contour lines enable you to judge the severity of the terrain and can help judge the timing of walks (See the section on Safety). The closer together the lines are, the steeper the gradient. The field lines, by indicating the shape of fields will help you to work out your position as will indications of other features (e.g. farms, churches, barn, streams etc etc). One of the difficulties walkers have with map reading, especially if trying to follow a walk from a book, is that the map only sees daylight once they become "lost". It is actually sometimes quite difficult to relate the land you see around you to what is shown on the map if there are no clearly distinguishing features. If however you have plotted your course first and then referred regularly to the map during the walk, you will always have a pretty good idea where you are eg. the footpath going over a marked footbridge, passing through a wall, past a barn or a farm etc. Do not be lulled into a false sense of security by thinking because you have seen a clearly marked signpost (eg. 3 miles to village x) or a bright yellow blob on a farm wall that there will necessarily be another equivalent marker when the path becomes indistinct on the fell or even changes to another landowner's property. In the UK, we seem to have a bad habit of only doing half a job on footpath marking! This can also be a time when use of the compass comes into its own. However to be effective in route finding, you need to know where you are when you use it. Although it is theoretically possible to establish your location by using the compass, this assumes that you can clearly identify some landmarks. This is not always so straightforward.